Learn how to prepare delicious Japanese dumplings, a delicious noodle and the Japanese omelette tamago like Japanese sushi chefs. The Japanese cuisine offers many delicate and tasty meatless dishes. It certainly will not be boring! Many Japanese vegetarian dishes were developed in the Buddhist monks of Kyoto in Kyoto and the tasteful dishes have since become part of the Japanese cuisine. Japanese vegetarian dishes are more challenging to make as different techniques are used to make the tasty dishes. What do you learn at the course? You will get an introduction to Japanese food traditions and the classic Japanese vegetarian kitchen. 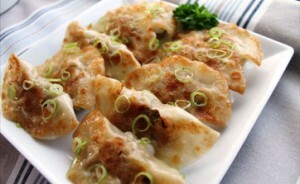 You will be introduced to popular produce such as cabbage, shiitake mushrooms, tofu and ginger. You learn to apply and measure Japanese ingredients such as mirin and cooking stuff which is indispensable in the Japanese vegetable kitchen. You learn about the difference between dried noodles and fresh noodles and what the benefit is of using fresh noodles. You learn to handle the various precursors of the omelet dough and make the technically difficult omelet Tamago. You work with various Japanese cooking techniques such as baking, blanching, frying and cutting various ingredients. You learn step by step to make Japanese dumplings also called gyoza, a noodle with edamame beans and a dish with Japanese omelet. A total of 3 dishes that you bring home. These courses below will be held in Danish and in Denmark. The courses can also be held in English if it is booked outside Denmark.